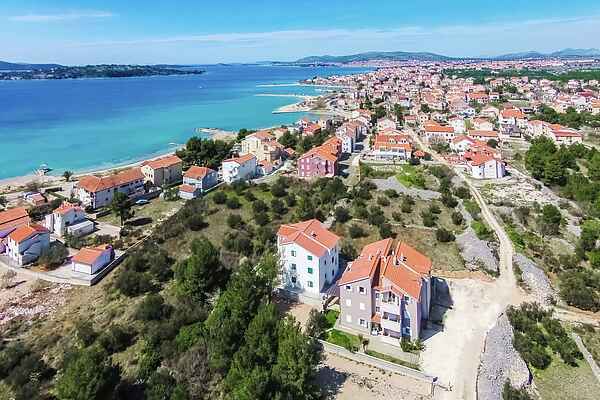 Apartment Maslina is situated in Srima, 3 km away from well known tourist resort Vodice and 10 km away from Sibenik, town of rich cultural heritage. Spacious 1st floor apartment located in a quiet area features 3 bedrooms and a large living room with terrace overlooking the sea. In the common, fenced garden there is a playing area suitable for children. Pebbled beach is only 200 meters away. Within the distance of 300 meters you can find a grocery store, caffes, restaurants, beaches and tourist information office. Srima is an ideal place for those who want to relax and seek a stress free vacation. Apartment Maslina is ideal for 2 families or group of friends. Vodice, famous for its dynamic night life can be reached in a short drive or 20 minutes of walking by the sea. Famous night club Hacienda is only 4 km away and island of Murter with its world known summer music festivals is reachable in a 15 minute car drive. In the vicinity there are 2 national parks, Krka waterfalls and Kornati islands which can be visited by orginised excursions. Also, National parks Plitvice lakes and Paklenica could all be visited in 1 Day trip. Within a 60 km radius there are two international airports Zadar and Split, both connecting south of Croatia to numerous European destinations.